Decluttering and downsizing has always been a priority on my New Years resolution list for years and honestly, I never really stuck to it. I have a really bad habit of hoarding and collecting things (thanks to my mum who is like the queen of hoarding). I always think about how I want to have a smaller makeup collection. So, for the past few weeks I have been trying to achieve this by making a few changes here and there. I think I'm getting somewhere and I'm pretty chuffed with that! Here are a few bits of advice and some of my tips that helped me to downsize my makeup collection. I remember last year I controlled the urge to shop by literally having a makeup buying ban. I had enough makeup to last me a decade and definitely did not have to add to my extensive collection. Make sure you put an end to your beauty shopping by avoiding Boots and Superdrug at all costs. If you happen to run out of your last mascara or concealer, limit yourself to only buying what you need. Don't just buy things because you want it. You'll notice that this helps budget-wise too (aka, more money to spend on food). If you want to downsize, your going to have to only keep the bare necessities. If you have three of the same concealers and two mascaras... you need to stop hoarding. Keep one and get rid of the rest. Stop collecting things like the shop is going to run out of that lipstick. We live in an age where online shopping is at our fingertips, so just order it if you run out in an emergency! If you have some nice newer bits of makeup that really don't suit you or you don't get along with, donate them to your loved ones! They might like the products and at least you are not entirely wasting your money by giving it to a better home. Expiry dates are usually on the product itself. Try looking for a number written in a drawing of a small container on the label (see image below). If you are unsure of how old the product is and you can't seem to find an expiry date on it... it's probably a good idea to just throw it out! Perhaps you don't want to completely part with a product even though it needs to be used... try this tip. I have a main makeup collection that is currently kept in a makeup case (I'm working on getting rid of this soon as it encourages me to fill it up). I put my daily essentials in a separate makeup bag so that I only use those products everyday. Every week I evaluate what's in my bag and what I like and don't like and switch things up. If I don't get along with something, I throw it or donate it and if I like it, it stays until I use it up fully. And there we go... a few tips to a smaller makeup collection. How do you declutter and downsize your beauty stash? 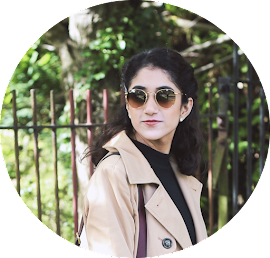 What an amazing post Fatima, I did this recently and feel so much happier with what I have in my make up stash now. I realised how much crap I had stored over the years, many of which I had never once touched and probably never will! I think I'm quite lucky in the fact that I hate hoarding things, make-up, clothes, books, anything, I cannot stand keeping items which I'm never going to use or wear. I'm odd I know haha! But, I still loved reading this post as I've downsized mine so much recently. I always find myself giving away make-up to my family and they love it! I never keep to expiry dates...I'm awful at it. Haha lucky you!! I wish I wasn't such a collector of things! Such fab tips! I had a clear out quite recently but looking at this post I think I need to go in stronger and get rid of more!! Simplicity also calms me down! I can't stand having to rummage through drawers every morning! Great tips Fatima, hope you had a lovely start to the week.